Ludwig Renn was the son of a tutor at the court of Dresden. He served in the army during the First World War and afterwards he studied Russian, economics and art history. His novels "Krieg" ("War") and "Nachkrieg" ("After War") were published in 1928 and 1930. During the nazi era he was imprisoned from 1933 to 1935 before he fled to Spain. In Spain he took part in the Civil War. He was imprisoned in France but French intellectuals released him in 1939. He travelled to England and emigrated to Mexico in 1940. From 1941 to 1946 he was the president of the Bewegung Freies Deutsland (Movement Free Germany). In 1947 he returned to Germany and he held several positions in Dresden. He was homosexual and in Dresden he lived with Max Hunger, who was a native of that city. In 1949 Hans Pierschel lived with them as well. In 1951 he became a tutor at the Humboldt University in Berlin and in 1952 he became a member of the (East German) Academy of Arts. he lived with Max and Hans in Berlin-Kaulsdorf. 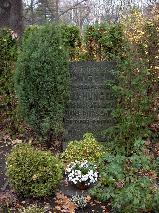 Renn died in 1979 in Berlin and was buried at the Zentralfriedhof Friedrichsfelde. His friends were buried in the same grave. The grave of Ludwig Renn at the Städtischer Zentralfriedhof Friedrichsfelde, Berlin.